The breakfast strike at my house continues, which has put me on a quest to find something healthy, that both my kids will eat, and can be eaten and made relatively quickly on a school morning. No problem right? Which led us to our first attempt muffins. I found this great recipe on Annies-Eats for Peanut Butter Banana Oatmeal Muffins, which sounded delicious. The recipe called for oatmeal, bananas, peanut butter and applesauce all of which sounded pretty healthy. I enlisted the help of the Bee in making the muffins, hoping the excitement of making the muffins would carry over to the eating. We started by measuring out 1 1/2 cups of all purpose flour, 1 cup of oats, 1 teaspoon of baking powder, 1/2 teaspoon of baking soda, 1/2 teaspoon of salt and mixing them into a bowl. In another bowl we mixed 2 tablespoons of applesauce, 3/4 a cup of light brown sugar, 2 large eggs, 3 large bananas mashed, 6 tablespoons of peanut butter and 1 cup of low fat buttermilk. We then combined the two bowls, mixing just until all the ingredients were combined. The Bee put paper liners into the muffin tins, the recipe makes 18 muffins, while I preheated the oven to 350 degrees. I let the Bee use an ice cream scoop to fill up the muffin cups, so they were not exactly equally distributed but she was so proud to do it herself, it was worth it. We then baked the muffins for about 20 minutes, until I stuck a knife in the muffins and it came out clean. 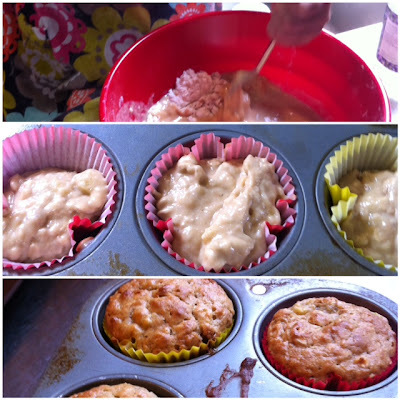 After letting them cool we all sampled the muffins and they were delicious! Both girls scarfed down their muffins, and I was confident I had found the solution to our breakfast woes. The next morning we came down for breakfast and I was already looking forward to another delicious muffin. I got breakfast ready, pumped everyone up for muffins and nothing. Neither one of them even touched the muffins. So while I continue to hunt for the breakfast answer for the Bee and Bean, I figured I would share this recipe because at least I thought they were delicious!